I put together a video that explains some of the well-known Windows settings related to Windows 10 upgrades. It also demonstrates how some of the background tasks that Microsoft installs along with its Windows 10 program files actively reset system settings that you might have changed. You can view the video here, and the full transcript appears below. The Windows Update patch named KB3035583 is most well known for installing the "Get Windows 10" icon app on Windows 7 and Windows 8 computers. The first version of KB3035583 began appearing on peoples' computers in early-to-mid 2015, but Microsoft has released several subsequent versions since that time, under the same name. If your computer is configured to install Windows updates automatically and you already have a version of KB3035583 installed, Windows Update installs the new versions of the patch on your PC as they become available, replacing the pre-existing version. The 'Get Windows 10' icon app. Aside from the Get Windows 10 icon app, KB3035583 includes a number of other programs that play different roles in Microsoft's aggressive campaign for the widespread adoption of Windows 10. Like the Get Windows 10 app, these programs are scheduled to run at certain times, or in response to certain events, as defined in the Windows Task Scheduler. Almost as soon as Microsoft began pushing the Get Windows 10 app to the public, users of Windows 7 and Windows 8 who weren't interested in upgrading to Windows 10 began looking for ways to get rid of the icon and prevent unwanted operating system upgrades. There are some well-known registry values associated with the Get Windows 10 app and various other aspects of Microsoft's Windows 10 upgrade apparatus. One of these registry values, DisableGWX, hides the Get Windows 10 icon from your notification area. If you have the KB3035583 patch installed and Windows launches a scheduled instance of the Get Windows 10 app, the app immediately checks for this registry value and silently exits without displaying the icon if the value exists and has a value of 1. Having this registry value in place does not prevent the KB3035583 patch from being installed, and doesn't prevent the other background tasks associated with the patch from running. It only prevents the Get Windows 10 icon and related notifications from appearing in your notification area. Another registry value, AllowOSUpgrade, plays a part in certain aspects of the Windows 10 Upgrade process, although its full purpose is not publicly documented. If the value exists and is set to zero, it appears to prevent Windows 10 Upgrades that are initiated via Windows Update from succeeding. You might think this would protect you from an unwanted Windows 10 upgrade, but it's not quite that simple. You see, on many computers, some of the scheduled background tasks associated with the KB3035583 patch re-enable the AllowOSUpgrade value by setting it to 1. One of these tasks, refreshgwxconfig-B is scheduled to run twice a day. If yours is one of the affected computers and you manually disable the AllowOSUpgrade value by setting it to 0, the scheduled task will re-enable it the next time it runs. Note: If you watch the video that accompanies this post, you can see the refreshgwxconfig-B task reset the AllowOSUpgrade setting in real time. Another Windows 10 registry value that scheduled background tasks routinely reset is ReservationsAllowed. Interestingly, unlike AllowOSUpgrade, which gets enabled every time the tasks run, ReservationsAllowed gets disabled (set to zero) instead. Again, there is very little official information on the purpose of this registry value, and the only Microsoft knowledge base article that mentions it (KB3080351) has been proven to be incorrect. [Update: On January 13 they finally corrected this knowledge base document; it no longer mentions ReservationsAllowed at all.] My own theory as to why the background tasks are disabling the ReservationsAllowed setting is that Microsoft has transitioned away from the reservation system they originally used at Windows 10's launch, and have instead introduced several methods of performing immediate upgrades. You don't need to reserve an upgrade anymore; you simply upgrade. It might occur to you that simply uninstalling the KB3035583 patch would solve the problem of Windows changing your system settings behind your back. Unfortunately, if you already had previous versions of the patch installed that were subsequently upgraded by newer versions, attempting to remove the patch now just rolls you back to an earlier version. It won't fully remove the patch anymore. (You can see this demonstrated in the video.) And these files are hard to remove manually, since they are protected by additional layers of Windows security that require more than simple administrator access. GWX Control Panel is a free tool that checks for many of the files and system settings associated with Windows 10 upgrades. It can disable or enable the Get Windows 10 app and disable or enable the ability to perform Windows 10 Upgrades just like you can do in the Windows registry. It also has a special Monitor Mode that alerts you if it detects new files or settings that may leave you vulnerable to Windows 10. (For example, it notifies you if Windows re-enables the AllowOSUpgrade registry value.) It can also delete hard-to-remove files like the secret Windows 10 Download folders and the KB3035583 program files and scheduled tasks. If you prefer to take care of all these things manually, the information is out there. You just have to know what to look for. GWX Control Panel is just a quick, easy, and free way to reclaim control over your current operating system. My video covered some specific system settings that had been getting discussed (and debated) in the news recently, but here's some additional information not covered in the video. One of the more important registry settings related to the Windows 10 upgrade process is a Windows Update policy setting called DisableOSUpgrade. You can set this value manually, or by editing a property in the Local Group Policy Editor control panel (gpedit.msc). You can find instructions on how to set this property in this knowledge base article. The 'Turn off the upgrade to the latest version of Windows through Windows Update' option in the Local Group Policy Editor manages the DisableOSUpgrade registry value. The registry value doesn't exist by default; you must create it manually and set it to 1 (or do so indirectly via the Policy Editor) in order for it to take effect. Also keep in mind that you have to enable this setting in order to disable some Windows 10 upgrade scenarios. One observation here: I've noticed that if you set the DisableOSUpgrade setting manually, that change doesn't get reflected in the Local Policy Group Editor... you can't always trust what you see in the control panel. The only way to be sure the value exists and is set properly is to navigate to the correct location in Regedit (or use the "Save Diagnostic Logs" feature of GWX Control Panel, which will tell you if it determines that the registry value is missing or incorrect). In the video I discussed a couple of upgrade-related settings that get reset by various KB3035583 background tasks. While I haven't seen any background tasks change the DisableOSUpgrade setting, the registry value is not necessarily permanent, either. The problem is that Microsoft occasionally pushes update patches for Windows Update itself, and these patches sometimes wipe out existing Windows Update settings, including the DisableOSUpgrade value. (Here's an example of one such patch where I and several of my users observed this behavior.) These Windows Update client updates are kind of special, because Microsoft can push them to your computer automatically, even if you have your Windows Update settings configured to "Check for updates but let me choose whether to download and install them" or "Download updates but let me choose whether to install them." This is because they sometimes include necessary changes in order to communicate properly with Microsoft's update servers. I don't believe this is a malicious or targeted change on Microsoft's part (it's essentially a re-install/clean slate for Windows Update sometimes), but the fact is that you can't expect your Windows 10-related registry changes to "stick" 100% of the time. Luckily, this is yet another system setting that GWX Control Panel checks for (ever since version 1.3), and the program's Monitor Mode will alert you if any recent updates delete or otherwise change your settings- also and give you the chance to fix it with a single click. 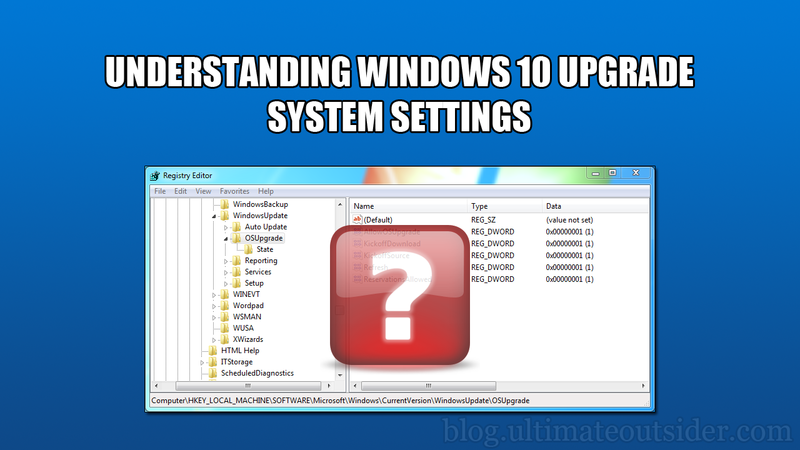 You can configure several aspects of Windows 10 upgrade behavior by tweaking some registry settings, although concrete information on these settings can be hard to find. Some of these Windows settings can change while you're not looking, as a result of scheduled tasks or occasional Windows Update patches, so some vigilance is advisable if you're intent on keeping your current operating system and minimizing unwanted upgrade notifications. The KB3035583 patch is a lot more than just the "Get Windows 10" icon, and some of its associated scheduled tasks can revert system settings that you change manually. Uninstalling KB3035583 doesn't always actually remove the program files, since Windows only lets you uninstall the most recent version of the update. If you already had a version of the patch installed before the most recent one landed on your system, "uninstalling" the patch will just restore the previous version. GWX Control Panel isn't required to prevent Windows 10 and its associated annoyances, but it's a convenient, quick, and safe way to check and change your settings and fix other Windows 10-related problems and annoyances. @Samantha - Thanks so much! Thank you for taking the time to create the GWX Control Panel. It solved my particular problem, which was that there was no way to install Windows Updates manually. It looks like Windows put the "Get Windows 10 banner" in the same location as the "Install updates for your computer" box... Or, what I should say, is that they replaced the latter with the former. After using your program to turn off this banner, the normal option to install updates reappeared! Yay! I'm going to be telling people about this! I would like to see the .EXE offered with a series of command line switches. This would allow GWX to run at reboot time. @L - Thanks, glad it worked out! @Bruce - That's a very popular feature request. Look for it in an upcoming release. Love your program, using it on many computers. Someone now wants to go ahead and upgrade. Is it as simple as clicking all the buttons to re-enable the upgrades? Ok, found a section on this. Looks like it is not automatic and I will need windows media creation tool. I HAVE USED GWX CONTROL PANEL IN THE PAST BUT NOW I'M READY TO UPGRADE TO WINDOWS 10. WHAT DO I HAVE TO DO? Thanks for an awesome product. Thanks a million for sharing your expertise with your many followers! It would certainly be beyond the ability for us to prevent W10 from self installing without your help. The great detail and clarity is a skill not often found in the tech area. If I may ask one simple question. I never know if I can install a update over an existing one; or must I uninstall the old program or can I just install the new download? @imseeker - I actually JUST updated that "I HAVE USED GWX CONTROL PANEL IN THE PAST BUT NOW I'M READY TO UPGRADE TO WINDOWS 10. WHAT DO I HAVE TO DO?" section of the FAQ with some additional information and more detailed instructions a few minutes ago. Check it out in case you saw it before I published the update. There are three scheduled task that you have to not only take ownership of, but grant your user account full control. located under scheduled task-> microsoft->setup. disable anything related to gwx, but dont delete. as ms may reinstall them. The task themsevles can be found under windows\system32\tasks. Thanks so much! I am more of a linux guy, but need windows for my HTPC. I've never been one of those anti-microsoft guys, however, this B.S. with Windows 10 is making me re-think that position. I'm really grateful for your program! I dont want to give control of my computers to MS under any circumstances. I realised my laptop which hasn't been used since May had not been made safe from GWX. So I installed and set GWX CP before update KB3035583 was installed. Now when it checks for updates it just keeps checking, neither finding updates or telling me there are no updates. Have I done anything to break updates and is it fixable? @Graham - Worry not! If Windows Update says no updates are available after you check for updates, they're telling the truth! GWX Control Panel doesn't interfere with Windows Update, but since I'm pretty experienced with it, I wrote a walkthrough for troubleshooting Windows Update problems at the troubleshooting guide, under "I USED GWX CONTROL PANEL AND NOW I GET HANGS OR ERRORS WHEN I TRY TO CHECK FOR WINDOWS UPDATES." Thanks for your prompt reply. I'll let you know how I get on! I've had to start Software Protection and I have set the laptop to stay on while plugged in. Out of interest, what are people going to do in 2020? @A&L - Thanks for your report. I figured out what was going on (the program was actually working- it just wasn't refreshing the screen on some PCs), and have fixed it in the latest version (1.7.2). Ultimate Outsider, your GWX Control Panel is a godsend! Thank you so much. I've been hearing that Microsoft is planning to issue Win10 as a standard update soon, so anyone who automatically downloads recommended updates (like me) is a target. Does GWX protect against that? Or do I need to just stop accepting Windows updates altogether? @wendyND - Thanks! The goal behind GWX Control Panel is to let you install whatever updates you want, notify you if any known Windows 10 settings or files are found, and give you the chance to remove or neutralize them. The "Prevent Windows 10 Upgrades" feature of GWX Control Panel is enough to protect you from Microsoft's most recent push. If they change their tactics in the future, I'll update the program accordingly. Thank you so much for this. Was getting ready to switch back to Linux (which ffffffuuuu- linux audio) and then I saw your program. It still makes me a little nauseous running an OS from a manufacturer that's turned to malware tactics to push an "upgrade" with such clear overtones of dystopia, but at least I can get updates now without doing extensive research on each and every one that's going through. "The update adds capabilities to some computers (Win7 & Win8.1) that lets users easily learn about Windows 10 or start an upgrade to Windows 10." Do you have any comments as to how this update impacts the GWX issue? @DougCuk - I analyzed that update the day it came out (and so did a couple of my friends) and we couldn't find any actual signs that it does anything bad. We're keeping an eye on it. You almost certainly don't need the patch, so it's likely safe to uninstall/block. But I haven't spotted any bad behaviors from it yet. Josh thankyou for a beautifully designed, efficient and effective little utility (the GWX Control Panel). How very refreshing to (a) find an honest programmer who doesn't secretly bundle in any other third party crapware and (b) to come across someone who can SPELL and WRITE correctly, informatively and eloquently. (I think I love this part the best about coming across Ultimate Outsider!!). GWX Control Panel did exactly what it said, it was easy to use and the documentation (in written and video format) was excellent. (Thanks too to Gordon Kelly who provided the link and sent me in your direction via his article "Microsoft Reveals Real Cost of "Free" Windows 10"). The KB3035583 update was set to download onto my PC, but even just the act of clicking on it and asking for more information results in Microsoft pummelling you with a "Share Your Experience" request (I assume, for after you've downloaded the Windows 10 upgrade) and while I'd have liked to use that opportunity to tell them I didn't appreciate their sneaky tactics, I'm even wary of doing that now. I think this aggressive and furtive stealth-upgrade is going to cost them dearly once more people become aware of it. It's near impossible to restore customer faith and belief in a company's integrity once its been lost. @Sue - I am humbled and flattered by your kindness. I do believe that Microsoft underestimated the large amount of consumer trust they had built up over the previous couple of decades. They have some impressive statistics to crow about now that they've manipulated millions of people to upgrade their computers, but every day I hear from folks who feel frustrated, frightened, and even betrayed by how this whole Windows 10 campaign has panned out. Yep, I think it'll be a game-changer for them (but not in a good way). I'm not surprised people feel betrayed by it. It seems so desperate. Reassuring though to know I'm now protected from it, so many thanks Josh. Great work! Josh, your GWX control panes is a life saver, I've used it on several computers of people that rely on me for their system health and again, it is awesome. I do, however, get regular relaunches of Windows OS upgrades enabled and don't really know what to do about it, but keeping GWX in monitor mode is a small price to pay. As for Micrisoft, the way they're trying everything to get us to upgrade...no words. If I weren't reliant on Windows for several programs I use daily, I'd be gone by now. I still have a bunch of 100% valid XP CD's that I keep re-using when their respective machines die. Once I am no longer able to validate XP on these repaired machines (sometimes, a re-install is also needed when replacing MoBo's) I am going to HAVE TO switch to Linux. With this move, I am calling it QUITS with Windows. Sigh. I've been using it since the late 80's, but this is it. I'm done. :( So far, "Linux Mint" seems to be the most Windows-friendly distro. Just wanted to thank you for making the GWX control panel utility. I really appreciate it! Sent you a little donation, wish I could send more. Sorry folks, illness kept me away from the computer for the past few weeks. Still catching up. @Sophia - You're very kind, thanks! Thanks! No need to respond to me, but when you do get that update out that allows us to have program run immediately at start up in such a way to prevent windows from changing settings, then I would love to know. I learned that one person had many apps that would not work on Windows 10, but he didn't elaborate. I do know that some games do not work and that one game was wonky on windows 10. My nephew had to upgrade back to windows 8. Thanks again! I am glad that you're feeling better now! :D Sorry you were sick at all though. 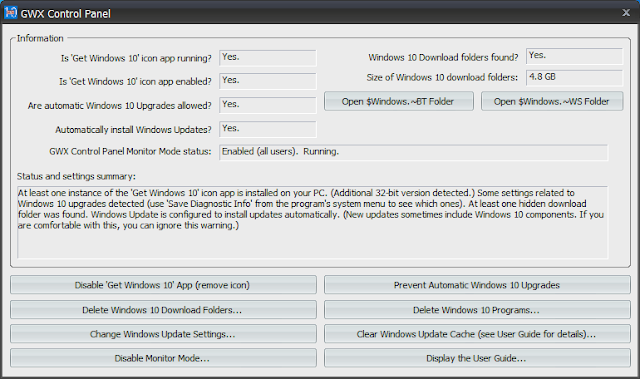 @tpkyteroo - Recent versions of my program have a "monitor mode" feature that runs in the background and notifies you of system changes. If that's what you're talking about, that's there now! See the "Click to enable Monitor Mode" button. @Will It - Logmein is a remote desktop type solution, yeah? What I would do is log in to the remote PC and launch a browser to the downloads page, where you can download the installer or the stand-alone EXE. If you're looking for something else, please be more detailed. Just curious... now that the July 29'th date has passed, did MS actually stop cramming WIN10 down our throats? @Willie - For the time being, yes. If you do a Windows Update scan now they are not trying to push any new versions of the known Windows 10 updates, and if you already have the Microsoft "Get Windows 10" app installed it no longer bothers you to upgrade. Given the very sneaky, deceptive way they conducted the initial campaign though (and given the news we've heard about Windows 10- about how Microsoft is both increasing the number of in-OS ads and decreasing the number of ways of preventing those ads from appearing), I believe they will kick off another upgrade campaign again. I have written some GWX Control Panel uninstallation instructions for people who trust Microsoft not to try something like this again, but they lost any trust I had in them just over a year ago when this whole "Get Windows 10" thing began. I'm definitely not planning to uninstall this software anytime soon... because as you just said, MS totally blew it. I don't trust them *AT ALL, ANYMORE, PERIOD*!! Just the way they are making it impossible for non-Enterprise users to disable updates, is reason enough to slam the door on them! I've read all too many nightmares of users with specialized hardware (like radio stations, doctors offices, etc) have their systems TRASHED when WIN10 took over and deleted their software and/or drivers. UGH!